These errors are common with third-party themes and plugins – especially ones that haven’t been updated in a while. The error occurs because a function used to “escape” strings before being stored in the database has been deprecated. Escaping is the process of removing characters that can lead to SQL injection and XSS. The existing escape() function was deprecated in WordPress v3.6 RC2 and missed the previous released, and so may have gone unnoticed. The reason for this deprecation was security related, so could not be avoided. The wpdb:escape() function (found in wp-includes/wp-db.php) has been replaces with the newer esc_sql() function. Update your PHP init settings to stop reporting E_NOTICES errors. This option is not recommended, as it’s just masking the errors and not really fixing them. Since the error is just a notice, it’s not going to break anything and it’s the quickest way to fix your WordPress site. However, this won’t be possible for everyone to do, as you need the ability to change your PHP settings – something that is not possible on share hosting providers. If you are on a VPS or dedicated hosting provider, this is a very quick fix for you. This is the longest but also the recommended option. You basically have to manually go though all your plugins or themes to look for references to $wpdb->escape or $this->wpdb->escape and replace all instances with esc_sql. It’s a straightforward find-and-replace, but it just means going through a lot of files. 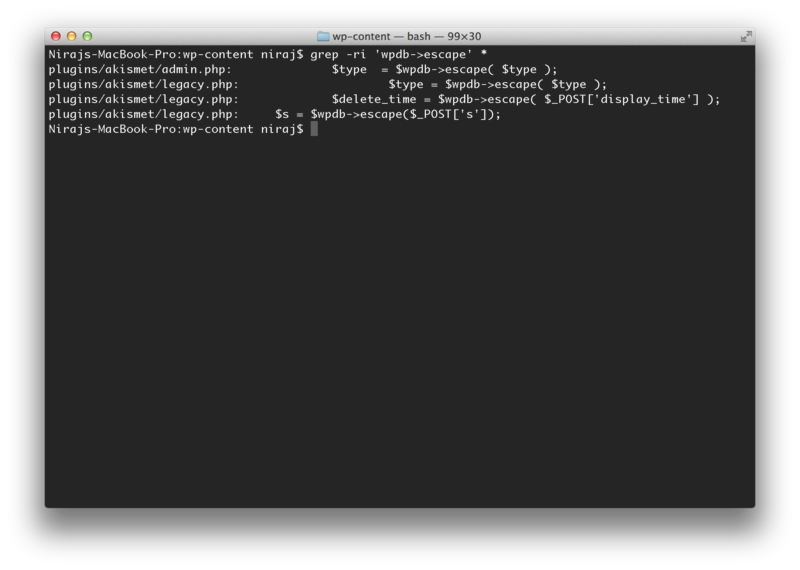 Or simply replace $wpdb->escape with esc_sql. Thanks, this helpful tip worked 4 me! It’s amazing to me that major plugins (looking at you Backup Buddy) still haven’t resolved this a year later. Hi guys, Thanks for the tip, looked around for hours but the problem is that it worked perfectly in one file but not in an other. I have now a fatal error : Call to undefined function esc_sql() in… Tryed manythings in vain; I’m a zero in PHP and not so good in english. Could you help me please. All my sites are crashed for hours. Unfortunately, you either need to update all the plugins / themes to the latest version and hope that it fixes the issue, or you’ll need to manually go and edit each of the affected files. Make sure you back-up any plugins / files before you edit, so you can revert if something goes wrong.